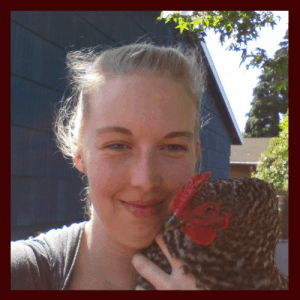 It’s a bit of an oxymoron, but I’m a homesteader who hates cooking. Home grown, home cooked food is supposed to be one of the pinnacles of successful homesteading. However, for me, the less time I spend in the kitchen the better! Roasted vegetable recipes are a great way to cook healthy, homegrown food, and not have to sit and watch a pot all day. One trick I’ve learned is creating a rotation of easy, but healthy recipes that I don’t have to think about. Roasted vegetables are one of the easiest to add in. If it’s robust enough, it can even be an entire dinner. And if you like to have a little more substance in your meals it’s easy enough to add in a meat and a salad and call it a day. 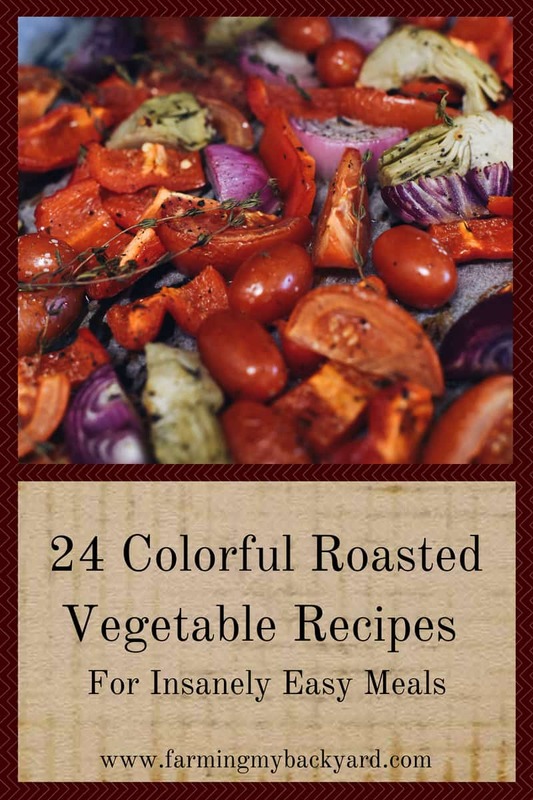 Here are some colorful and delicious roasted vegetable recipes! Feel free to try out these recipes, keep a handful of your favorites, and rotate through them for easy, basic meal planning. Try this simple roast vegetables recipe from Drug Store Divas. There’s no peeling involved, and it’s a great way to use up zucchini for all you garden-skilled people that can actually get it to grow. I really like carrots, but I really hate peeling and chopping them. Luckily, Drug Store Diva’s has a great oven roasted carrot recipe where all you have to do is cut the carrots in half! This Spiced Roasted Cauliflower recipe from Noshing With The Nolands is a quick and easy side dish that can go with so many different things. Want more cauliflower recipes? Check out 53 Tantalizing Cauliflower Recipes For When You Have Extra and 48 MORE Cauliflower Recipes That You’ll Want To Eat. I suppose the most classic roasted vegetables recipe is potatoes, but unfortunately most of the time they require being peeled. However, using red potatoes adds more color AND has the added benefit of not needing peeled, which makes this recipe by Coupon Clipping Cook a winner. As averse as I am to chopping, sometimes it can be excused when the result is as exquisitely delicious as this Citrus and Thyme Roasted Carrots recipe from Delicious Obsessions. Classic “boring” vegetables such as broccoli can be much more interesting as long as you add some flavor. Check out this Balsamic Roasted Vegetables recipe from Joy Food Sunshine for how to make it. And citrus can work it’s magic on other vegetables as well! Try this Citrus Roasted Cauliflower from Cooking on The Weekends! Brussels sprouts are best roasted, and if you haven’t liked them before now, try giving them another go using this honey balsamic marinade from Delicious Obsessions. If you want to add a bit more color into your diet, using sweet potatoes instead of white potatoes is a quick and easy switch. And you certainly can’t go wrong with Roasted Maple Cinnamon Sweet Potatoes from Yay For Food. Roasted vegetables recipes certainly are winners when it comes to beautiful color contrasts, and this Roasted Balsamic Root Vegetables with Almond Pesto is no exception. So beautiful. So delicious. If you’ve never considered putting Brussels sprouts into a salad you may want to take a peek at how What Great Grandma Ate does it. Looks yummy! I seriously wish I had found this oven roasted Parmesan green bean recipe last summer when our CSA box was overflowing with green beans! You’ve got to check it out. Sometimes we may enjoy a vegetable in one form, but not in the other. I do not care for raw radishes at all. I suspect there are more than a few of you out there who may agree. However, roasted radishes can be a different story, as this recipe from Finding Zest can attest to. And certainly don’t forget that by combining certain foods you can get complete proteins without having to eat meat! This Honey Mustard Roasted Vegetable Quinoa Salad can be a complete meal all on it’s own! Get the recipe from Joy Food Sunshine. Roasted vegetable recipes that are one pot meals are the best! Adding chickpeas into your roasted vegetables instantly adds protein and a fun twist. The best type of one pot meals. Check out this Roasted Cauliflower, Potatoes and Chickpeas recipe from Panning The Globe. I love that you can cook up a batch of this Roasted Greek Salad ahead of time and then have it ready to go on busy days. Find out how at What Great Grandma Ate. For more time saving tricks, try roasting your cauliflower whole, such as in this recipe with homemade alfredo sauce from Fearless Dining. Of course a lot of produce is at its best during the summer, and I know my appetite for hot food can wane when it gets hot outside. Luckily, you can cook vegetables ahead of time and then use them in salads, like with this roasted beet and tomato salad from Ann’s Entitled Life. You really can’t go wrong with soup. Even with nothing but vegetables, a good soup is hard to pass up. Check out this recipe from Joy Food and Sunshine. Don’t forget ways to use up leftover! Put those roasted vegetable recipes to work double time! Left overs can be repurposed into an entire second meal! Here’s a roasted veggie soup from Gluten Free Easily. For a more classic soup, check out Easy Potato Chowder You Can Make From Your Homestead. Sometimes the simplest recipes are the most delicious. Vegetables and herbs can be such an amazing combination. For example. check out this carrot and tarragon recipe from Neil’s Healthy Meals. For more colorful and delicious herb combinations, check out this Roasted Cauliflower with Turmeric and Mint from A Clean Bake. An interesting twist on traditional roasted vegetable recipes is adding in a sauce. You can get an idea on how to do that with this cauliflower and Brussel’s sprouts salad recipe from Veggies Save The Day. Want more sauces over roasted vegetables? How about this creamy cashew dressing from Dianne’s Vegan Kitchen? Cooking from the garden doesn’t have to mean a lot of work. And it certainly doesn’t mean you have to be an amazing cook! Give some of these recipes a try for colorful, easy meals. I love roasted veggies especially sheet pan recipes with lots of veggies. Super good! What I love even more and SUPER easy recipes. Definitely gonna check some of these out and get the into a rotation since I’m working toward eating more of a plant-based diet. Finding keeper recipes will really help a lot! I’m a fan of the easy ones too! Wow! All of these sound so amazing. Cannot wait to try them! Growing up in a meat filled home it is sometimes hard for me to cook with large amounts of veggies -excited to have found some new recipes to try out. Thank you! The easiest way I’ve found to eat more vegetables is to make a couple big vegetable dishes a week and then portion them out each day.